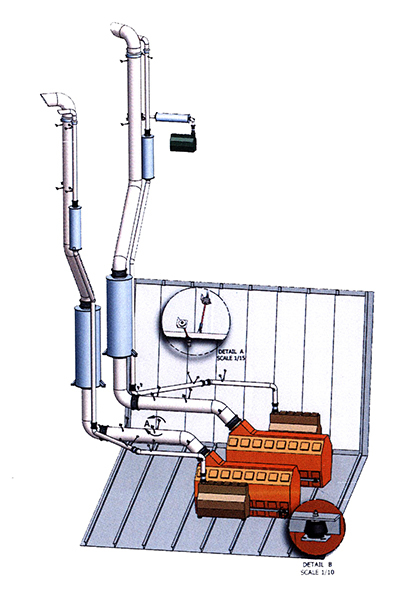 Dry stack exhaust systems are a major source of structure-borne noise in vessels of all sizes. This is of particular concern in vessels such as tugs and OSVs where the exhaust piping runs close to accommodations and work areas. For upper decks, structure-borne noise from isolated exhaust piping is a bigger contributor to noise than a hard-mounted engine. Soundown’s Rubber Design exhaust mounting system provides a comprehensive approach to isolating the exhaust system from the vessel’s structure. Our system includes all the equipment needed to support the piping system, including mounts, bellows, deck and bullhead penetrations, and rain caps. Our approach to dry exhaust system pipe isolation is designed to make the process as easy as possible for the shipyard. It starts with a review of the piping diagram to determine thermal growth and the vibrational characteristics of the system. The piping is divided into sections that are each anchored by a flexible fixed point and supported along their length by flexible stabilizers that isolate the pipe while allowing thermal growth. Each section is separated by flexible stainless steel exhaust bellows. When we have completed the review of the piping, we provide a technical spec that includes all required components as well as a drawing that shows the mount positions. Each position is numbered on the drawing and spec. Here’s one actual example of a spec Soundown developed from a customer sketch of their desired stack path, with all the details we typically provide. When the mounts are delivered, the position numbers will be marked to help match the spec with the components and make installation as easy and effective as possible.